A 19-year-old died after being shot Friday night in Boston's Dorchester neighborhood. 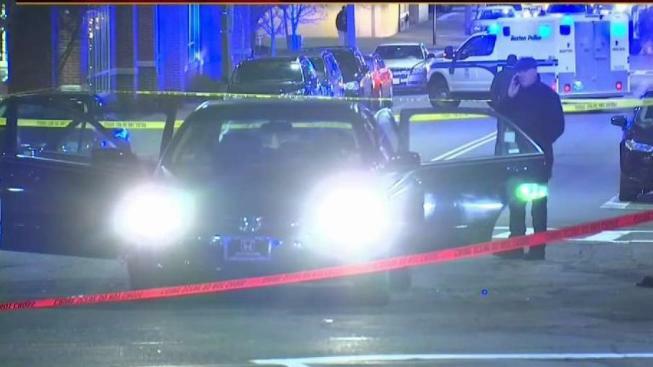 A 19-year-old has died after being shot in Boston's Dorchester neighborhood. The victim, who has not been identified, was in the backseat of a Honda Civic on Norwell Street when the fatal shooting occurred. "It's a tragedy," Boston Police Commissioner William Gross said. "That could be a future leader. We don’t know. Because a life’s taken too soon." Police received a call at 7:06 p.m. for shots fired on Norwell Avenue. Responding officers found the car on Talbot Avenue and Norfolk Street, with the 19-year-old victim sitting in the back seat where he was suffering from life-threatening injuries after having been shot in the upper torso. The victim was rushed to a local hospital where he was pronounced dead. Authorities say the suspect shot into the back seat of the car while trying to park on Norwell. That's when the driver took off. At the time of the shooting, Boston City Council President and District 4 Councilor Andrea Campbell was hosting a public safety meeting nearby. Those inside the meeting tell NBC10 Boston that they could hear the commotion just outside the Codman Square Health Center where the safety meeting was being held. Michael Folan was one of about 50 attending the meeting, and he says they were about an hour into it when all the police officers rushed out the door. Gross says this is an act of senseless violence, marking the 52nd homicide of the year. "Frustration with how many guns are on the streets," Commissioner Gross said of his reaction to the shooting. "It seems as soon as we take them off, more fall into the hands. In the last week or so we’ve had like 10 guns removed from the street but you’ll always hear me say this there’s more people doing good than bad." At the same date last year, there had been 50 homicides, so the city is up two homicides for this time of year. Anyone with information is asked to call police at 1-800-494-TIPS. They say you can remain anonymous.